Ideal for toning & strengthening stomach, waist and legs, arms, hips, thighs and works on the tummy at the same time. Portable and light weight,‎ can be used anywhere anytime.‎ Firms chests and arms,Tightens hips and thighs. Effective & Easy to Use: It consists of a contoured foam coated plastic handle and foam pedals to nicely fit into your hands and around your feet. High Strength Material:Thick bold natural latex tube, high tensile strength, tens of thousands of times by tensile testing, safe, durable, easy to break. Foam wrapped handle, non-toxic no stimulation, safety and environmental protection, to avoid movement due to climate change or cause excessive heat, moisture, slippage occurs, comfortable. If u want to do waist exercise. If u want to do shoulder exercise. If u want to do arm exercise. If u want to do leg exercise. Join us,let’s use the Elastic Expander to beauty our body. 1. It can be used at home or in the office to shape your body, trim the waist. It helps to strengthen your arms, legs, hips, thighs and works on the tummy at the same time. 2.Thick bold natural latex tube, high tensile strength, tens of thousands of times by tensile testing, safe, durable, easy to break. Perfect attention to detail, in a tiny place for you to check, and resolutely refused to shoddy, allowing you to experience the perfect visual experience. 3.Foot parts made of TPR material, the tensile strength of up to a dozen Mpa, elongation at break of up to more than 1 times, non-toxic, no smell, safety and environmental protection. 4.Foam wrapped handle, non-toxic no stimulation, safety and environmental protection, to avoid movement due to climate change or cause excessive heat, moisture, slippage occurs, comfortable. 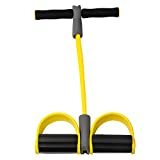 5.This body trimmer is a stretching piece of exercise equipment using a strong rubber tube between your hands and feet.